An easy way to decorate simply and inexpensively is to incorporate the things you love and use already as part of your home decor. Add a few books to the dresser in your guest room to add a warm, hospitable touch to the room. Be sure to use a variety of books that will appeal to your guests so that they can actually read the books you’ve used! If you have a current reading pile, why not incorporate those books into your decor by stacking a few of them nicely on your nightstand? Try laying them down, standing them up and reordering them to see what looks best. 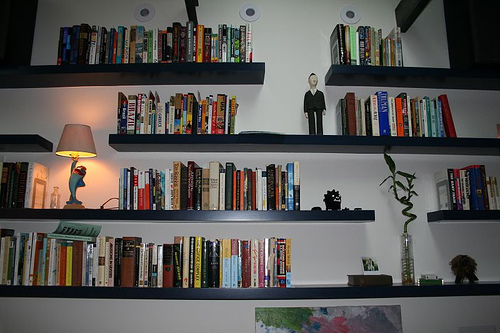 A popular way to use books as part of your decor is to organize them by color rather than by author, title or subject. You could separate out one color to go in a specific room or simply organize your shelves by color. Coffee table books are a classic staple of decorating and hospitality for a reason. Try stacking one or two on your coffee table or even leaving one open to invite people to page through it. Display well-loved and heirloom cookbooks rather than hiding them away in your cabinets. Use a bookshelf or display rack in kids’ rooms and play rooms. They’ll serve as decor for the room and, more importantly, entice your little ones to pick up a book more often! In what ways do you use books as part of your home decor? Do you have any empty shelf or surface you’ve been wanting to fill that you could use to display books instead of purchasing a knick knack?